The Director of the Kadist Art Foundation in Paris, Emilie Villez, took part in a seminar about artistic research organized by Sandra Delacourt, Katia Schneller, and Vanessa Theodoroupoulou. Villez spoke about her involvement in the exhibition “Beyond the End” at Kadist in 2014. The transcription of her responses to questions about Ensayos and “Beyond the End” were published by B42. B42 publishes books about graphic design, typography, pop culture and contemporary art, artist and designer writings; books that question our visual environment. 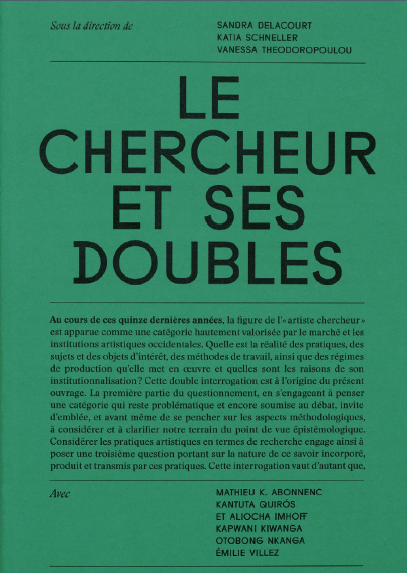 The book can be bought here: http://editions-b42.com/books/chercheur-et-ses-doubles/ . It is only in French.